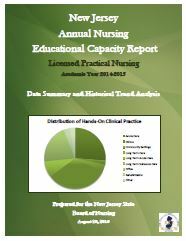 The New Jersey Collaborating Center for Nursing (the Center) is the primary source for data on New Jersey’s nurse workforce. The Center also serves as a catalyst for the implementation of innovative education and practice models. 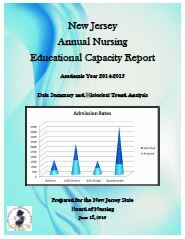 To that end, the Center’s conducts an annual survey of all nursing schools on behalf of the New Jersey State Board of Nursing in an effort to monitor enrollment and graduation trends, and demographics of both students and faculty. If you would like to view the whole report for 2016, please select the button to the left to download the .pdf of the full report. Abbreviated highlights can be found at our “Quickfacts” Page. Abbreviated Fact Sheets can be found at our “Quickfacts” Page.